55% of registered voters, including 34% of Republicans, say increased wall funding isn’t worth a shutdown. A 47% plurality also said passing a bill to protect special counsel Robert Mueller’s job isn’t worth shutting down the government. As the Dec. 7 deadline approaches to keep the government partially funded, a familiar song and dance has returned to Washington: President Donald Trump is threatening to shut down the federal bureaucracy if he doesn’t get his full request for funding for a proposed wall on the U.S-Mexico border. “I think, probably, if I were ever going to do a shutdown over border security — when you look at the caravan, when you look at the mess, when you look at the people coming in — this would be a very good time to do a shutdown,” he told reporters in Washington on Nov. 17 after Congress left for its Thanksgiving recess. Once again, a potential shutdown over about a $5 billion increase in wall funding does not appear to play well with most voters, a Morning Consult/Politico survey shows. In the Nov. 15-18 survey, 55 percent of registered voters said increased wall funding would not be important enough to warrant a shutdown of the federal government, compared with 31 percent who said it would be. That included majorities of Democrats and independents, while Republicans were somewhat more divided. While nearly half (49 percent) of GOP voters supported the idea, 34 percent did not. Funding for a number of government agencies – including the Department of Homeland Security, the State Department and the Justice Department – will run out in December if lawmakers and the president do not reach a deal, which would force a partial government shutdown and furlough workers deemed “non-essential.” Trump signed into law funding for major health, veteran and defense programs in late September. Senate Majority Leader Mitch McConnell (R-Ky.) said “no” Nov. 14 when asked if there could be a December government shutdown, while Senate Minority Leader Chuck Schumer (D-N.Y.) urged Trump to stay out of negotiations and let lawmakers work things out. 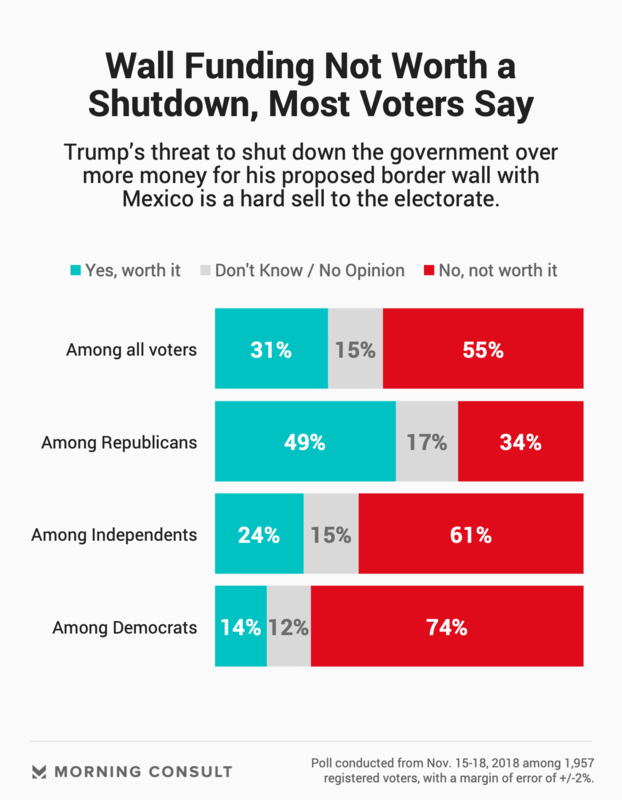 Trump has repeatedly threatened to shut down the government over wall funding, and each time, Morning Consult/Politico tracking has found the idea unpopular with voters. In August, before Congress agreed to funding for the defense and health programs, 62 percent of voters said funding for the wall was not worth a shutdown, and last December, ahead of the Democratic-led shutdown in January over protections for “Dreamers” — young people who were brought to the country illegally as children, often with their parents — 56 percent of voters said the wall wasn’t worth it. A poll in spring 2017 found 54 percent of voters said the same. Among Republicans, those who believe the wall merits a shutdown fell 5 percentage points since August, just outside the sample’s 3-point margin of error, after staying consistent in the other surveys. The overall poll has a margin of error of 2 points. Generally, voters do not prioritize constructing a wall along the U.S.-Mexico border as highly as the president appears to. In the latest poll, just 26 percent of voters called funding the border wall a “top priority” – the lowest among the 10 options tested. And while it looks like a shutdown over wall funding wouldn’t fly with most of the voting public, a demand from some Democrats that could potentially also force a shutdown was similarly ill-received. Some Democrats have pushed for a bill to protect special counsel Robert Mueller’s investigation into Russian interference of the 2016 presidential election since Trump replaced Attorney General Jeff Sessions with Russia skeptic Matthew Whitaker. Nearly half (47 percent) of voters said they don’t think passing such legislation is worth a shutdown, compared with 27 percent who said it would be.